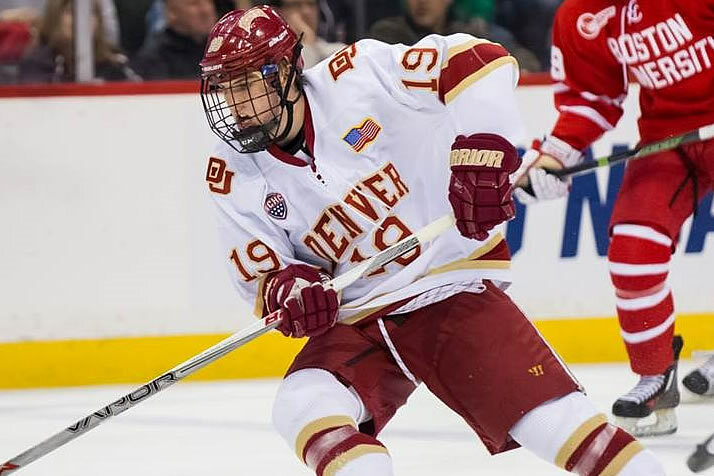 Current, Former Players Seek Olympic Gold - College Hockey, Inc.
Fourteen schools have representatives named to U.S. Olympic Team, including four current NCAA players. NCAA champion Troy Terry is tied for ninth nationally with 25 points this season for Denver. Updated: Jan. 11 to reflect addition of goaltender David Leggio. Current and former players from 14 NCAA schools were among those named to the 2018 U.S. Men’s Olympic Team, USA Hockey has announced. Will Borgen (St. Cloud State), Ryan Donato (Harvard), Jordan Greenway (Boston University) and Troy Terry (Denver) are the four current players named to the team, which will be coached by Wisconsin head coach Tony Granato and will compete at the 2018 Winter Olympics in PyeongChang, South Korea. Greenway is one of four Terriers named to the team, joining alumni Chris Bourque, Matt Gilroy and John McCarthy. Yale (three players), Harvard (two) and St. Cloud State (two) also had multiple representatives named to the team. Former Boston College star Brian Gionta was named captain of the team, which does not feature current NHL players for the first time since 1994. Gionta is the lone player on the roster with Olympic experience, having represented the U.S. in 2006. Seventeen of the 25 players named currently play professionally in Europe. Those are highlighted by former college stars Mark Arcobello (Yale), Garrett Roe (St. Cloud State) and Ryan Gunderson (Vermont). Donato leads the NCAA with 1.00 goals per game in 2017-18 (12 in 12 GP) and ranks second in points per game with 1.67 (20 points in 12 GP). The junior was the Ivy League Player of the Year and led Harvard to the Frozen Four last season. Terry won a gold medal at the World Junior Championship and the NCAA title last season. He ranks tied for ninth nationally with 25 points in 20 games this season. Greenway, who was a teammate of Terry’s on the 2017 U.S. National Junior Team, has 17 points in 19 games this season with BU. He had a hat trick and an assist in the Terriers’ most recent game, Dec. 9 vs. UMass Lowell. Borgen has helped lead St. Cloud to a 12-2-3 start and the No. 1 ranking nationally. The defensive defenseman has eight points in 17 games this season. The U.S. opens Olympic play Feb. 14 with a preliminary round game against Slovenia.